In football, gap integrity means being where you’re supposed to be when you’re supposed to be there. Defenses can fail when just one person is out of position or does not carry out his assigned responsibility. Each defensive player is assigned a specific gap and is expected to defend that ground. If a player is not in his assigned gap, no one else will be there to cover the offense because they have their own gaps to fill. As a result, the other team gains ground. 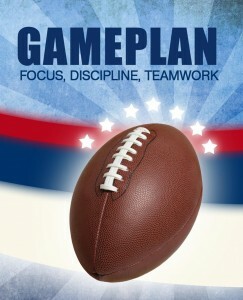 A talented football team can fail when it lacks discipline and does not follow the strategy given by the coaches. In this way, a less-talented offense can exploit that more-talented defense and score points. In life, we have to live obediently and strategically in our work responsibilities, marriages, friendships, parenting, etc. Not filling these gaps – not being where we’re supposed to be when we’re supposed to be there – leaves our lives open for attack and failure. Not only does a lack of gap integrity cause us to personally fail, but we place the ones we care about in a position where they must struggle to trust and have confidence in us. As a result, the relationship is significantly damaged, and the other team scores points. A solid defense is one that gives its offense time and ground to do what it needs to do to score points. A good defense fills holes (gaps) the other team might be trying to exploit. A good defense listens to and follows the plan set forth by the coach. Many examples of godly leaders (coaches) exist: Elijah, Elisha, Isaiah, Jeremiah, Ezekiel, Samuel & Nathan. Unfortunately, the Israelites (players) refused to hear the message (follow the coach’s game plan). A good defense prepares for the plays the offense they are playing next typically runs. We all have plays that Satan likes to run on us, and he never has anything new. We need to be prepared for these offensive attacks. A good defense makes adjustments during the game. Because an offense constantly looks for holes in a defense, the defense must constantly adjust to the offenses new plan of attack. Jesus gives us the perfect example of a solid defense in Matthew 4:1-11. When Satan tempted Him, Jesus defended His ground with scripture. God’s Word gives us the game plan. The Bible exists as our best protection against the advances of the other team. Someone once said, “Christians don’t plan to sin, but they also don’t plan not to.” And in failing to have a plan, we end up in a dangerous place. For this reason, we must anticipate temptation and plan responses. No, we can’t plan for every possible scenario, but having a plan will give us a much greater chance of success. There are no timeouts, no half-time and no breaks. We must constantly be vigilant. We must keep in shape. We must fully know that the moment we think we’re okay is probably the moment we’re most vulnerable. AMPLIFY: Social situations constantly derail me. Satan knows to attack me when I am attempting to be social. For this reason, I must be vigilant in having a game plan whenever I know I will be social. Not just during social situations either, but even more so right after them when I am hardest on myself. Note: Thank you to those who commented on How to… Become A Defensive Specialist, giving much of the content for this post. DISCUSSION: Describe one of the strategies in your defensive game plan. This entry was posted in Victory! and tagged Christian defense, defensive strategy, gap integrity, Have a gameplan, Jesus tempted by Satan by admin. Bookmark the permalink. Having a proper defense is crucial. When you think you are strong, that's when you're likely to fall. I know that there are particular sins which I have victory over – but I'm still on guard. I know that if I let that guard down, I'll probably fall again. We can never think something won't ever happen to us, that is for certain. I am so thankful for the Holy Spirit's work in me to keep me on guard. I would certainly fall without Him. Wow, I am impressed. I am a former Defensive Coordinator and the message could have served well in my locker Chalk board sessions! By the way, "Standing in the Gap" preaches well from Nehemiah Chapters 2-4. Specifically, check out 4:15-23! Everyone guarded and protected their gap in the wall as they repaired the wall, ready to respond as anyone had a threat. Good message today Kari! I have to admit that I was a bit nervous about putting my limited knowledge of football out there when I knew you and Mark would be reading it and that you know WAY more about football than me. But, I took the chance anyway, especially since much of what I wrote came from comments from the two of you anyway. Nehemiah is one of my favorite books to study, and the standing in the gap idea is one of the reasons I love it so much. Thanks for the reminder of this scripture's application to today's post focus. I'll read through it again for sure when I'm done here. You're comment really encouraged me today. Thanks, Coach. Ditto! Stand Firm in Your Gap! The importance of gap integrity also highlights having a team. It does nothing to mind my gap, if I'm playing defense alone. I've seen an offense exploit the best defensive player on the field because he would crash through the hole, but he did it as an individual. He was deep into the backfield alone, his teammates holding their gaps as a unit, and the offense ran plays right behind him in the hole created by his overzealous play. For me, I'm not an isolated Christian. I live in relationship with God and His people. That's part of my defensive strategy to maintain godly integrity–to recognize I am a part of a faith-filled team. Excellent point, Tom. The scripture in Nehemiah that Coach referenced in his comment perfectly illustrates what you are saying. The people each had their part of the wall to defend, a specific gap to build and protect. As I read through this, I was struck by the many different people needed to build and secure this wall. Also, this topic of not being an isolated Christian has been heavy on my heart lately. I am seeing so many people fail in their defense because they tried to go it alone and didn't team up with others. Recognizing that no man is an island and that this walk of faith is to a great extent a team effort is huge in maintaining our godly integrity. There have been times I have regrets because my gap was untended. I think sometimes we also get caught up in thinking our gap is not as important as someone else's. He is guarding the front door; I'm just guarding the cellar door. An offense seldom attacks at the supposed strong point. They are looking for that person who is not being diligent covering his responsibility either because he is lazy, not discipline or does not think it is that important. I know computer hackers are always looking for that point of entry.. the supposed back door. I know the person on the football team whose sole responsibility is to protect the back side; the side away from the play; the side away from the action; the side where no one sees you or calls out your name; that person if not diligent every time can be burned badly and lose the entire game. We do have to be diligent; in preparation for attacks; in our measured response; in holding the post in obscurity; and in encouraging others to do the same. Recognizing someone who is holding their post without fanfare can encourage them to continue. To Tom's point we are together in this life and we effect each other and to encourage others in their gap integrity is so important. I think what works best there is to recognize when they have done so and to thank them at that time. Reminding someone to cover their gap is not necessary that much encouragement. Also to Mike's point when there has been a failure or breach on our part what should our response be? To moan and complain about what happened? No get to fixing that wall right away. You might have to call in help fixing it as would be appropriate. It is interesting when one is on defense and working on maintaining their gaps they are also trying to be on the offense in the sense they are aggressive and try to take the ball away so they can move from defense to taking an offensive mode. I think I could do at least one blog post a week JUST on what you, Coach and Tom put in your comments! Good stuff guys! The saying "A team is only as strong as its weakest member" fits with what you're saying here, Mark. Diligent. Prepared. Encouraging. I have also been thinking about how part of being a good defender is that little bit of offense that is happening while you're on defense. I like that idea! One reason I love sports and that we insisted that our boys are in at least on sport throughout high school is how much they teach not only about life but about God and spiritual growth. So much to process here, Mark. And I definitely think your comment along with Coach's comments as well as Tom's will make an excellent follow-up post. Truly, I feel honored to have all of you to learn from, both on the sports scene and in the area of spiritual growth. Know that you are impacting not just myself and the others visiting my blog but my kids as well. God has truly blessed me with your wisdom!